I am giving a talk on Friday at the Chicago Waldorf School about Healthy Lunches. This is something that I talk about a lot with parents who are new to the food-allergy world, and it's a topic that requires my personal attention on a daily basis. I first wrote this post a couple of years ago. With hundreds of lunches under my belt (and a second school-age child, now), I thought, in light of my upcoming presentation, it was time to repost with a few additions. It's a challenge that most families who send their kids to school face at some point or another ... what can you send for lunch that your child will actually eat? That challenge is compounded if your child's diet is restricted. Kids who already feel different can be pretty self-conscious about appearing "cool" in any way that they can. My son is a prime example of this. He will toss out any lunch that I pack that he thinks is weird. What's a mom (or dad) to do? First, talk to your child about what is and what is not acceptable. It's a waste of time, money and energy to send a lunch that just gets tossed into the trash. Next, consider some of these ideas as starting points for ways to meet both your child's nutrition needs and the all-important need to fit in. 1) A container of coconut-based yogurt with some dry cereal or safe granola to mix in. You can also send a thermos with chilled coconut milk drink (not canned coconut milk) or rice milk that they can add cereal to. Some fresh berries on the side are a tasty mix-in. 2) A container of applesauce and some safe trail mix. 3) Home-made pizza using a GF roll or biscuit and casein-free rice cheese or Daiya. 4) Celery filled with sunflower-seed butter or apple slices with sunflower-seed butter. 5) A wrap made with a warmed-up corn or other safe tortilla (to make it more pliable for rolling). 6) Hummus or bean dip with corn chips. 7) Welcoming Kitchen mini muffins like these or these with fruit or coconut-based yogurt. 8) A thermos of soup or pasta with olive oil or sauce. 9) A sandwich made with gluten-free beer bread. 10) Chocolate Sunflower Spread with safe crackers or bread. 11) Grain or pasta salads. Adding tasty side items is a safe way to ensure some energy is being consumed at lunch. 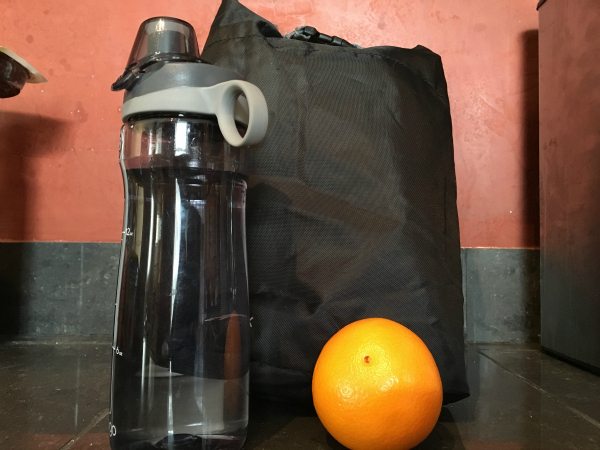 Remember fresh and dried fruit, fruit leathers, freeze-dried veggies or fresh veggies, pepitas and raisins and dried cereal as options to round out lunch bags. Also, a treat with a little nutritional merit can make for a happy child. Try rice pudding or granola chocolate chip cookies. These are just some ideas to get the conversation started. Welcoming Kitchen: 200 Delicious Allergen and Gluten-free Vegan Recipes is chock-full of lunch-bag possibilities, including recipes for biscuits and breads, soups and salads and loads of muffins. I have been really struggling to come up with ideas for school lunches for my boys lately. I seem to be in a rut, making the same old things over and over. So glad I came across this post on your blog. I couldn't agree more with you that not only is it hard to come up with a lunch that won't end up in the trash but even more difficult to come up with an allergy safe but fun lunch the kids will like. Thanks for these "out of the box" ideas. Thanks, Suzanne! At the end of the day, I think any lunch is a success if my kids eat it. Even if it's the same lunch day after day. Let us know if you have any ideas we missed!